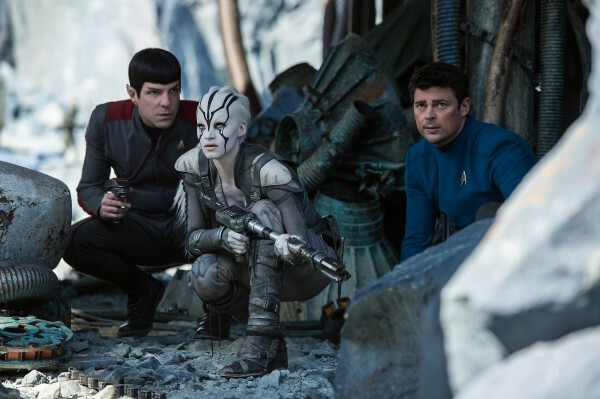 When the busy trailer for “Star Trek Beyond” – the third in the J.J. Abrams-produced and the thirteenth movie in the series overall – was released back in December set to the blasting sounds of The Beastie Boys “Sabotage”, I rolled my eyes and was ready to write this one-off. 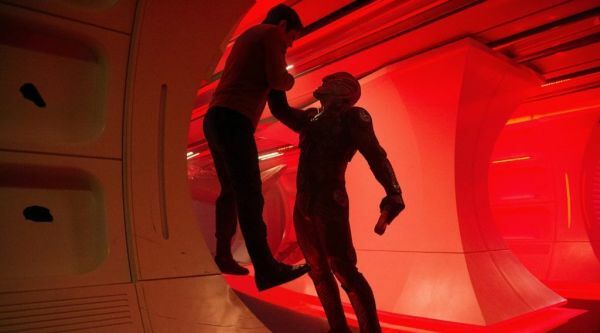 I bemoaned just like many other Star Trek fans, who felt that the music was out-of-place and that once again the heavy emphasis on action was straying away from the true intellectual sci-fi potential these movies could provide. Now that I’ve seen the movie, directed by Justin Lin (who recharged the “Fast and the Furious” franchise), I realize how quick to judge and narrow-minded I was. Not only is there a clever inclusion of that song here, but the action in this fascinating story populated with engaging characters is nothing short of mind-blowing. I love it when my initial response is completely flipped in the best way possible. After a new crew was established in the alternate universe of 2009’s “Star Trek” (which some understandably considered a reboot), they were then put through the ringer with 2013’s “Star Trek Into Darkness” (most viewers balked at an updated version of the Khan story). That story primarily took place on Earth; it’s great to finally see the crew of the USS Enterprise boldly going where those previous two movies have not gone before for the brand’s 50th anniversary. 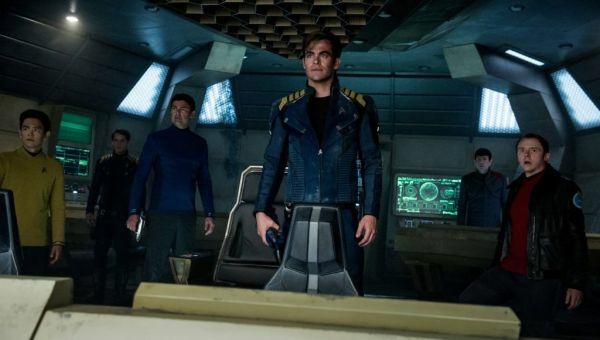 In “Star Trek Beyond”, we find Captain James T. Kirk (Chris Prine) feeling a little weary as he and his crew are three years into their five-year mission. He’s now thinking of a career move that would offer something more stationary or grounded. Unbeknownst to Kirk, his first officer Commander Spock (Zachary Quinto), is also starting to think of a different position after recently breaking off his relationship with communications officer Lt. Uhura (Zoe Saldana) in order to consider continuing the Vulcan species. Maybe the entire crew just needs some down time. That’s what they get when they arrive at the newly built space station, Yorktown, for re-provisioning and some well-needed shore leave. While chief engineer Montgomery Scott “Scotty” (Simon Pegg) works to maintain the ship’s functional levels with his sidekick Keenser (Deep Roy), helmsman Sulu (John Cho) reconnects with his husband and their daughter. During this time, Spock is briefed by Vulcan dignitaries that Spock Prime has died, causing the Vulcan to contemplate picking up his mentor’s ambassador duties. Just as the Yorktown’s commander, Commodore Paris (Shoreh Aghdashloo), entices Kirk with a Vice Admiral position at the base, Starfleet receives an urgent distress signal from a lone pod that escaped a recent skirmish in space. The inhabitant is Kalara (Lydia Wilson, with voice work by Sara Forsberg), who states her ship and crew are stranded on Altamid, a planet in a nearby nebula. Down time for the crew is put on hold, as the Enterprise is sent into unknown territory to save those in need. They arrive at the given location only to be attacked by a swarm of little ships that dissects the Enterprise, scattering the crew on the alien planet below. The crew must figure out who attacked them as they struggle to regroup, get their bearings and come up with a plan. They soon learn that they were attacked and marooned by the villainous Krall (Idris Elba) with the intent of procuring an ancient device stored aboard the Enterprise (called an “Aborath”) in order to unleash it upon Yorktown as a bioweapon as an act of revenge against Starfleet. With the help of Jaylah (Sofia Boutella, who proved her physical prowess in “Kingsman: The Secret Service”), an alien scavenger who previously escaped Krall’s encampment, the crew use what they can to release Krall’s prisoners and defeat him before countless lives perish. After “Into Darkness”, there were fans filled with trepidation as to what might come next. Since that movie was deemed a lazy rehash of “Wrath of Khan”, many wondered if the next sequel would be an update of, say, “The Voyage Home”. Thankfully, not so. Maybe fellow geek, Simon Pegg, heard the outcries of millions of Trekkies, motivating him to co-write “Beyond” with Doug Jung (who’s scribed TV series “Banshee” and “Dark Blue”, along with James Foley’s “Confidence” from 2003) and decided to send this Abrams-produced crew on a different albeit somewhat familiar mission. The writing duo offer a story that feels a warp drive away from any previous big-screen Trek adventures while providing a somewhat atypical villain. There’s quite a nice reveal to Elba’s Krall that I didn’t see coming (which may tell you how wrapped up I was in this engaging story), but ultimately it’s not enough. Krall is yet another bent-on-revenge antagonist whose agenda is mass death. That doesn’t mean we don’t get the solid performance we’ve come to expect from Elba – who plays big underneath some stellar makeup throughout most of the movie – because we do. It’s just that this tyrant could’ve had a stronger impact if we knew more about him. Pegg and Jung breeze through his past, but it’s kind of unclear (like someone speaking to you on “speaker” while driving with their window down) as are the explanation of his powers (superhuman strength that comes from siphoning the life force out of those he captures – space vampire, I think? ), but it’s all too vague. It’s as if they thought we wouldn’t be interested in knowing the “who” and “how” of this character – maybe they deemed what they provided enough. Fortunately, his characterization is really the only misfire of “Beyond”, a movie that visually dazzles with acrobatic camerawork from Lin and cinematographer Stephen F. Windon (who worked on “Fast Five” and “Fast & Furious 6” with Lin) and gorgeous art direction supervised by Don Macauley. I’m not surprised to learn Macauley worked on both “Elysium” and “Tomorrowland“, since Yorktown looks like a mashup of those future utopias with a dash of M.C. Escher. I found myself utterly impressed with the way Yorktown looked and functioned (much of which was apparently filmed in Dubai and then augmented with CGI). It seemed like something different was occurring at every turn and – for me, at least – it’s always fascinating to see a creative look at a functioning future world. With his resume, it’s no surprise that Lin’s strong suit is the action – whether it’s the Enterprise getting taken apart in space by Krall’s inescapable armada of insect-like ships that breach the starship’s hull and rip it from the inside out (lets face it, the Enterprise gets destroyed or stolen in almost every “Star Trek” movie, but this is like an attack of space termites!) or watching Kirk find a way to use an old American motorcycle on an alien planet to his advantage – “Beyond” gets beyond the introductions and the convoluted plot points of the previous movies and dives right into the thick of it with exuberant fervor. So, just as a science fiction blockbuster, this movie excels. Of course, there are viewers who’d prefer their“Star Trek” be less “summer blockbuster” and would rather see more thought-provoking material and I get that, but I feel with “Beyond” you can have it both ways. We hear Kirk reflect in his “Captain’s Log” that his disillusioned time in space has become “episodic” in nature, leading to his own growing boredom or restlessness. The fact that he’s now the same age as his father – Captain George Kirk (played in the 2009 film by Chris Hemsworth) who died as he led the USS. Kelvin to its swan song last stand, while his wife gave birth to James T. – weighs heavily on his heart. Has his career been about living up to his father’s reputation or is this something he’s chosen for himself? And now that he will live longer than his father, what should his future hold? Granted, it’s not social allegory, but such a conundrum is still thought-provoking, if not relatable. In fact, I’ve recently thought how, in ten years, I’ll be as old as my father was when he died. Where will I be in life? What will I be known as/for? Granted, I’m gleaning more into this Kirk narrative than is on-screen, but it is for me, no less provocative. This internal struggle (subtly played by Pine) and the many great interactive moments between characters that provide the movie with a fine balance to the dizzying visual effects. Just as Lin provided an emphasis on “family” in the “Fast & Furious” franchise, he gives the crew plenty of space to work as a team even when Pegg and Jung separate them (which coincidentally reminded me of the best moments of “The Voyage Home”, when the crew spread out in 1986). It’s when we see these characters split up that the actors are given a chance to shine, something you don’t often find in sequels that are more concerned with getting characters from A to B without a chance of discover or growth. I enjoyed seeing Scotty off on his own and eventually meeting and teaming up with the resourceful Jaylah, who booby traps her surroundings. We don’t often see ship navigator Ensign Pavel Chekov (played by the late Anton Yelchin, making viewers miss him even more) given the opportunity to prove his useful skills and seeing him partnered with Kirk as they scour the crash-landed Enterprise was something new. Easily the best pairing though was seeing a wounded Spock stranded with medical officer Leonard “Bones” McCoy (Karl Urban, proving to be the MVP of this crew), both of whom know how to get under each other’s skin, making for some entertaining banter. Quinto’s Spock explores his human side here more than Leonard Nimoy ever did (settle down, in no way does that make him better, just enough to remove himself from an impersonation), but it’s Urban’s McCoy who pushes him there. There’s always going to be some characters who lack quality screen time and here that unfortunately falls on Saldana’s Uhura and Cho’s Sulu. Although both characters are vital to the team and prove as much during some key moments, they still felt kind of underutilized. Once again, composer Michael Giacchino scored this sequel, who’s been doing so since 2009 and in his work here fans of the series will recognize callbacks to both the “The Original Series” (TOS) and The Next Generation (TNG) that are subtly incorporated throughout the movie. I caught “Beyond” in 3D on a Lie-MAX screen and while the added dimension was great, there was something off about the sound. At times, I strained to understand certain lines much to my chagrin. Part of the allure of the TOS and TNG television series was finding out who or what the Enterprise crew would encounter each episode and then how they will deal with any challenges and problems they’re presented with. I felt that here. 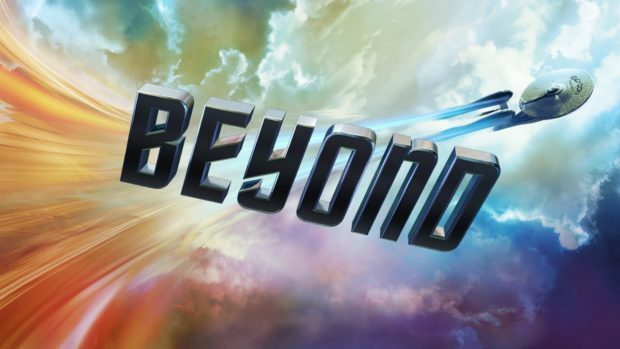 It’s an element that was absent in the last two movies and I’m hopeful that as this brand continues to reestablish itself with viewers, they will continue to be as creative and entertaining as “Beyond” is. For the most part, this boisterous sequel is terrific. Some may be deterred by the pedal-to-the-medal energy Lin injects, but I appreciated it, along with the humor in Pegg and Jung’s script. There is something upbeat and hopeful about “Beyond” – I can’t quite put my finger on, I just know I would gladly spend time with it again. This review appeared in slightly different form on David’s own site, Keeping It Reel. David's first film review for Fanboy Planet was "The Spiderwick Chronicles" in 2008 and has been a Chicago-based editor/writer for the site ever since. In 2009, he founded Keeping It Reel, where he remains the editor-in-chief and main film reviewer. David continues to review movies and cover film festivals there, while maintaining his membership in the Chicago Film Critics Association. He also volunteers with The Hero Initiative yearly to give back to the comic book creators that have and continue to inspire him.